Not only the name of one of my favourite bands, the fall sees all kinds of culinary treats appearing. 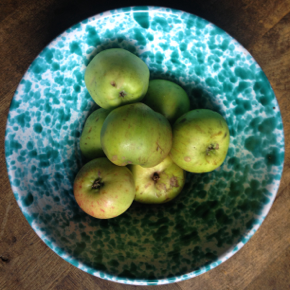 Here we have windfall bramley apples from Pontypridd just waiting to be cooked down into a buttery, soft compote, to be served alongside an almond cake scented with orange blossom. Meanwhile the last gasps of summer continue with courgettes still doing their thing on the allotment and even some tomatoes ripening in the greenhouse. This week’s menu for the Embassy Cafe here. Not going to be at the Embassy next week (14th/15th Oct) but back on the 21st as usual.